Maria Gaetana Agnesi & Family: What's Pasta Got to Do with Maria Agnesi ? What's Pasta Got to Do with Maria Agnesi ? When I was growing up, we sometimes ate a brand of pasta called Agnesi, the same spelling as Maria Gaetana Agnesi's last name. (As far as I know, there's no connection between Maria's family and the pasta company.) Since I was already familiar with the pasta when I learned about Maria, I had no trouble saying her name. It wasn't until I brought a draft of the biography to my critique group that I discovered that the pronunciation isn't obvious to everyone. Unfortunately, I haven't found a way to upload an audio file to this website, so I can't demonstrate the pronunciation for you. 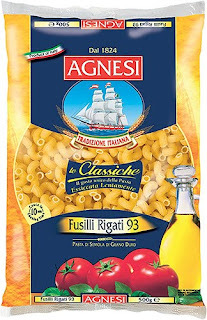 However, I did find the following commercial for Agnesi pasta on YouTube. Don't try to adjust your volume at the beginning, because there is silence for the first 10 seconds or so. Then a voice says, "Silenzio, parla Agnesi," which means "Silence, the Agnesi pasta is talking." The clip allows you to hear how an Italian pronounces the name "Agnesi." In case you're still not sure how to say it, just remember that Maria's last name, Agnesi, rhymes with "lazy," despite the fact that she was anything but. If you find phonetic spellings helpful, I'd go with on yay zee. (Keep in mind, I'm not a linguist.) Note that you do not pronounce the "g"--the letter pair "gn" in Italian is pronounced like the "ni" in "onion." Maria's middle name, Gaetana, is a bit tricky to say, too. I would probably spell it phonetically as gah eh tah nah, though most Italians I know would combine the first two syllables together to sound like the English word "guy," so I think guy tah nah is also acceptable. If you'd like to learn more about how to pronounce Italian words, you can see this website. Have I made you hungry for some pasta? Update 5/16/14: You can now hear Maria's whole name pronounced via YouTube. See this post for details. what a fun post! the whole blog is intriguing--great idea to share your research and dispel myths as you are writing the book.